Does it get any better than bacon + corn + a sweet & spicy honey chipotle glaze? This bacon wrapped corn is THE recipe that all your guests will be asking for after your next cookout! This is a sponsored conversation on behalf of Tyson; all opinions and text are my own. Thank you for supporting the brands that support this site! We use our grill year round, albeit slightly more conservatively throughout the colder months. In the winter, we lean toward simple grilled peppers, burgers and chicken, all items that don’t require a lot of attention while grilling. 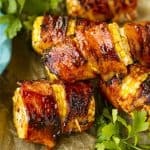 But when the weather warms up, I get the itch to experiment — and this amazing bacon wrapped corn is one of the results. It goes without saying that wrapping anything in bacon is a surefire way to add instant appeal, especially when you grill said item. 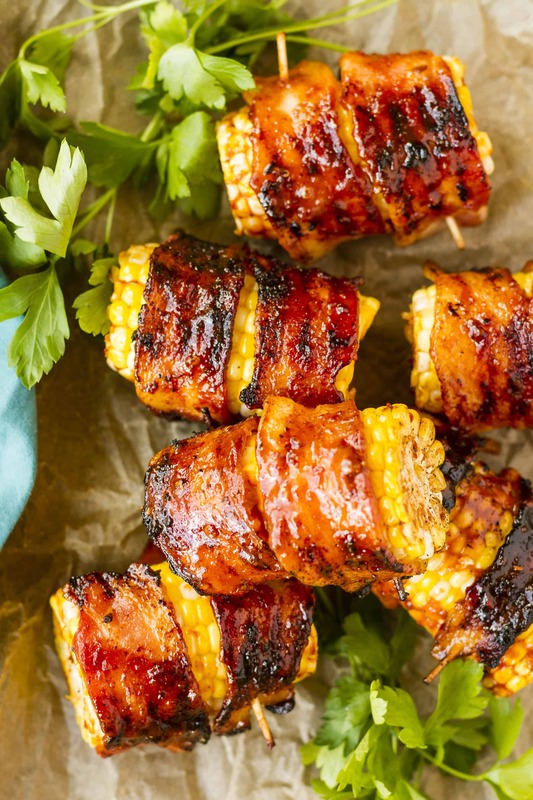 In the case of this bacon wrapped corn recipe, bacon lends a smoky, rich flavor that highlights the fresh sweet corn that’s abundant in the summer months. Slathering it all with a honey chipotle glaze gives it a lovely bit of sweet heat that really makes the bacon extra crispy and delicious. THIS is the recipe that all your guests will be asking for after your next cookout! This luscious honey chipotle glaze really ties the bacon and corn together, and it’s SO easy to make. Simply whisk together equals parts of melted butter, pureed chipotles in adobo sauce, and honey. Then stir in a couple tablespoons of apple cider vinegar, along with some garlic powder, cumin, salt, and pepper. This glaze can even be made ahead of time if you’d like, though it takes almost no time at all to throw together. Divide the glaze into two bowls, one for the initial slathering and one to continue basting the corn while it’s grilling. You’re going to want to use a high quality, thick cut bacon for this bacon wrapped corn recipe — like Wright® Brand bacon. Wright Brand bacon just so happens to be my very favorite bacon, based on both flavor and packaging. Their ziploc-style package makes it easy to pull out just a few pieces for a recipe and then seal the remainder up tight to use later. Though we rarely prepare less than a full package, it’s still an uber convenient feature when I need it. 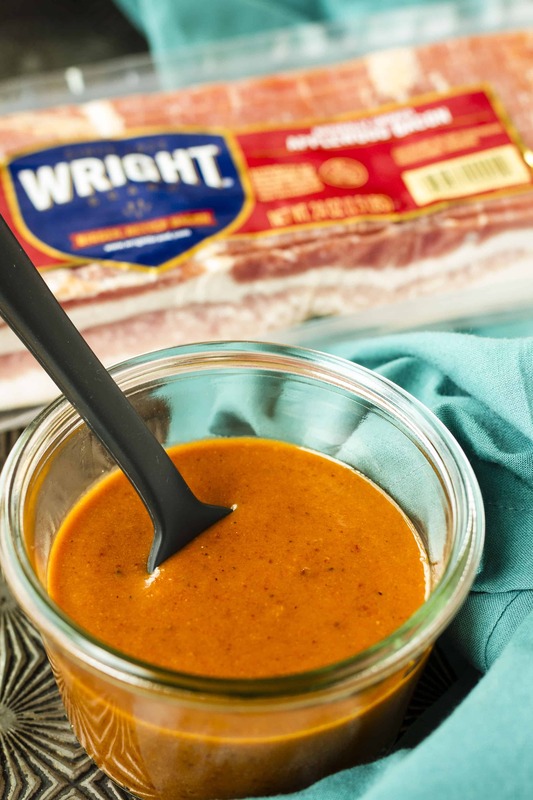 Wright Brand bacon’s hand cut and hand trimmed proprietary recipe stands up well to the grilling treatment, and the thick, smoky flavor is exactly what you want to meld with fresh sweet corn. My mouth is watering just thinking about it! Decide whether you want to wrap whole ears or half ears. I chose to wrap half ears to make the corn easier to eat for my smaller children, but you may want to go with whole ears for a cookout. You’ll need one piece of bacon for a half ear and two pieces for a whole ear. Wrap the bacon tightly. The bacon will loosen up as it cooks, so wrap the corn as tightly as you can to prevent the bacon from sliding around. Secure the bacon with toothpicks cut in half. I simple snipped some toothpicks in half with my kitchen scissors, and they were the perfect size for holding the bacon in place without protruding too far from the corn. 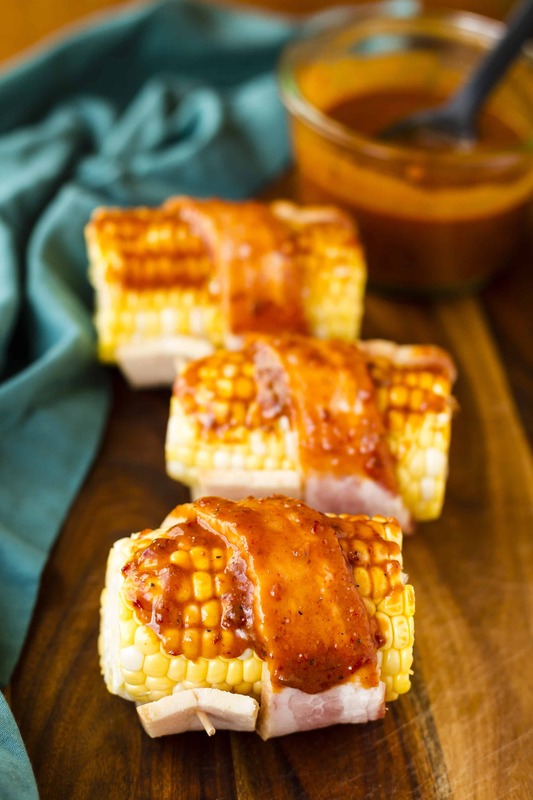 Once the corn is wrapped in bacon, slather it all with the honey chipotle glaze. Spray your grill with non-stick cooking spray, and grill over medium heat for about 20-25 minutes, until the bacon is crispy and the corn is cooked and starting to char. Turn the corn every 1-2 minutes while cooking, while occasionally basting it with the reserved glaze. While the grill warms up, mix chipotle peppers, honey and melted butter in a bowl to make the glaze. Stir in the garlic powder, cumin, salt and pepper. Divide the glaze in half, and set aside. Cut the ears of corn in half. 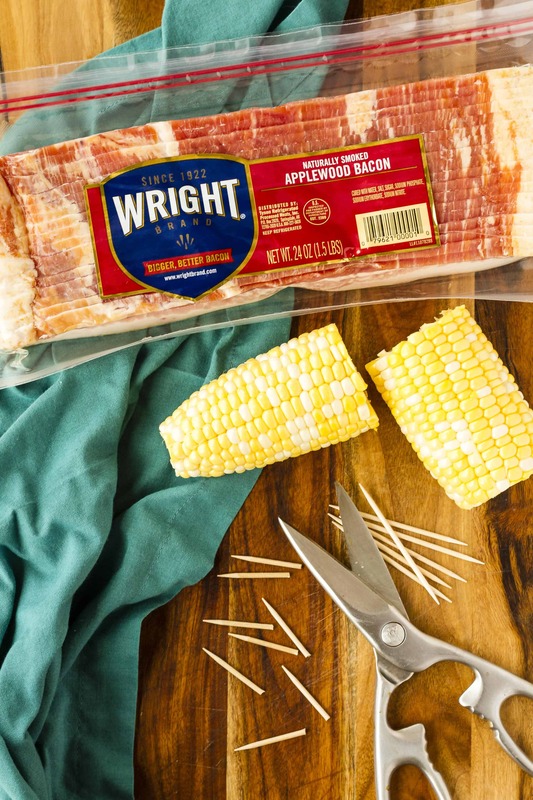 Wrap one slice of Wright® Brand bacon around each corn cob half. Stab the ends with toothpicks snipped in half to make sure that bacon doesn’t go anywhere. Spray the grill with non-stick cooking spray. Slather the wrapped corn cob halves with half of the honey chipotle glaze and place them on the grill. Grill over medium heat, turning the corn every 1-2 minutes and occasionally basting it with the remaining glaze. It should take about 20-25 minutes for the corn to cook and the bacon to crisp up. Remove corn from the grill, season with salt to taste, and dig in. These bacon wrapped jalapeno poppers are seriously addictive… Chives and onion cream cheese pair with crispy, smoky bacon along with a bit of a kick from the jalapenos, they’re the perfect combination of sweet and savory! You might also be interested in learning how to bake bacon in the oven. Oven baked bacon is, hands down, the easiest way to get perfectly crispy and delicious bacon with the least amount of mess! I’d love to see how your bacon wrapped corn turns out… Tag me @Unsophisticook on Instagram or use the hashtag #Unsophisticook so I can check it out. Enjoy! 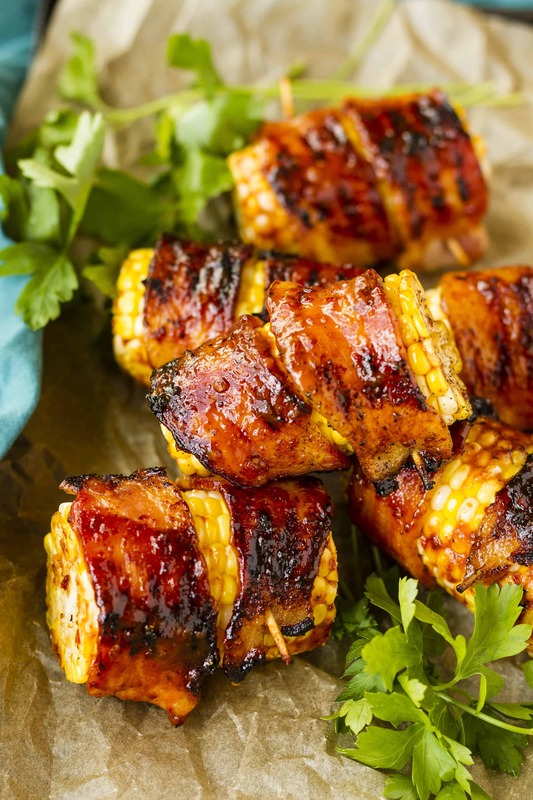 Your recipe for sweet & Spicy Bacon Wrapped Corn on the Cob is so delicious! thanks so much!